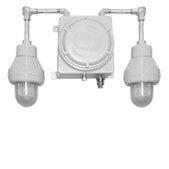 Heavy-duty LED units designed for Class I, Division 1 & 2, Groups C and D. Class II, Division 1 & 2, Groups E, F and G, Class III locations. Includes a housing designed for explosive/hazardous locations; and a nickel-cadmium battery available in 6V up to 30W & 12V up to 40W capacities. The EXP Family includes combination units, battery units, and remote heads available in many configurations to suit a range of industrial applications.